It is a bug. This will be fixed in Modelio 3.8.1. As a workaround, you can use an element of this profile in your model (For example add a stereotype to a model element) and export this model. 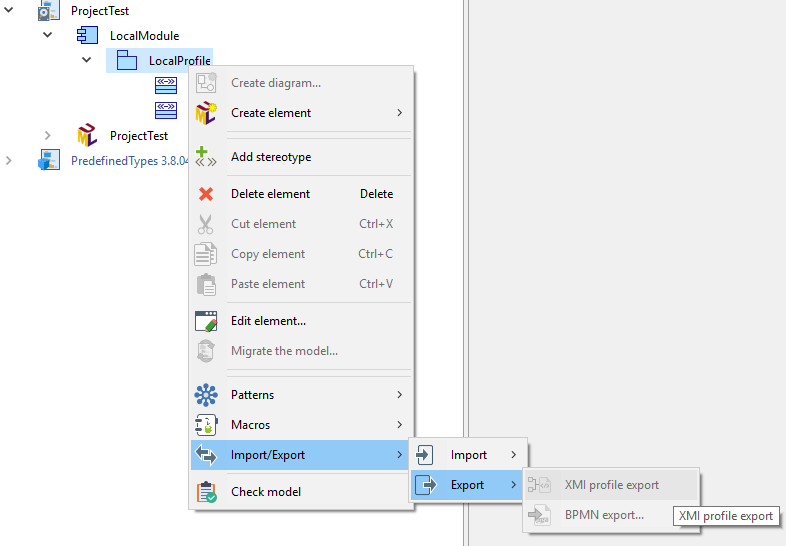 The profile will also be exported in the same folder as the xmi model. Ok, thanks for the answer. I will do like this to generate my LocalProfil. Good to know it's going to be fixed . When using the workaround to export LocalProfile the contents of the description field for stereotypes and notes/tags are not included. If exported directly to XMI in 3.8.1 will the descriptions be included? This would be a very useful features for us. Last Edit: 3 weeks 4 hours ago by mbicon. Yes, description on Stereotypes, NoteType and TagType will be exported as Comment.